The Index opened positive and stayed in a narrow range for the first few hours but saw huge dip towards 8057, responsive buying at lower levels saw the index back in green but closed just below at 8130.65, small loss of 4.45 points. The broader market was just negative, with 702 advances to 768 declines. The broader range as per Option Table stays at 8000-8500. 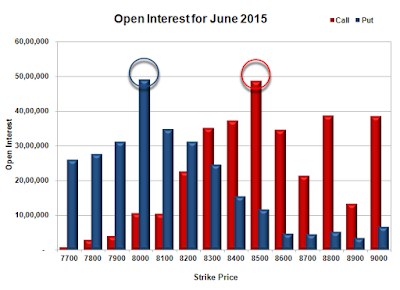 Call option 8000-8300, 8500-8600 added huge 14.10 lacs OI with profit booking seen at 8700 and above strike prices. Put option 8000-7700 added huge 11.87 lacs OI with short covering seen at 8100 and above strike prices. 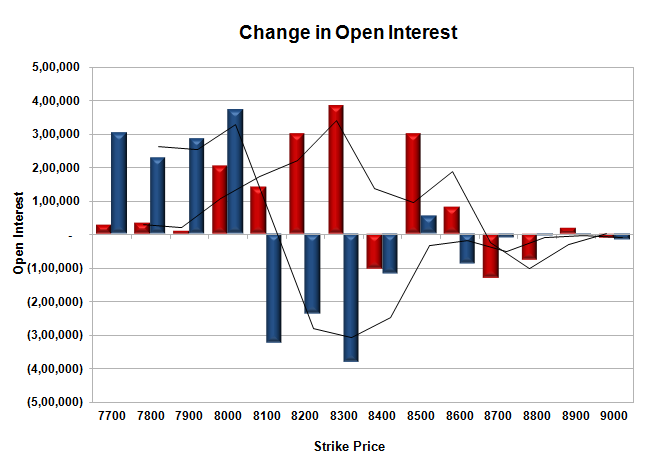 Nifty Open Interest is at 1,62,56,250 up by 2,31,550, with no change in price, most probably long/short build-up. 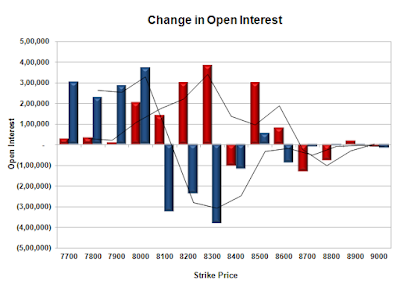 Bank Nifty Open Interest is at 22,97,650 up by 66,375, with no change in price, most probably short build-up. FII’s sold 0.16 lacs Futures, which includes 22246 contracts long build-up and 22898 contracts short build-up, with increase in net OI by 45144 contracts (includes 66681 longs to 67333 shorts for the day) and the Average Price comes to 8430.10. FII’s Index future open contract as on date is 345142 Longs to 306323 Shorts, Net Long 38819 contracts. Initial support still at 8100, with OI of 34.70 lacs and below that at 8000 with OI of 49.03 lacs. Initial resistance at 8200, with OI of 22.57 lacs and above that at 8300 with OI of 35.10 lacs. 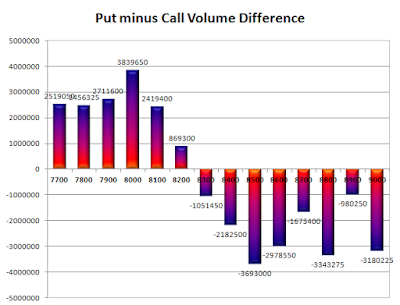 Day Range as per Option Table is 8038 - 8205 and as per VIX is 8054 - 8208 with 8116 as the Pivot.